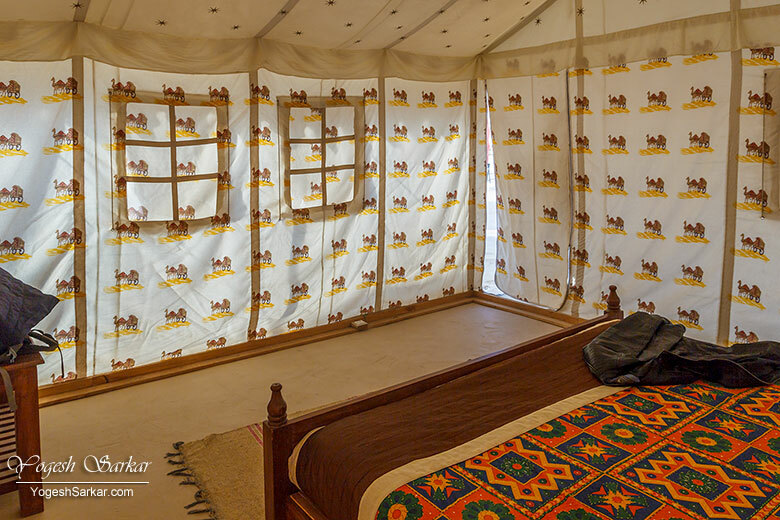 During my recent trip to Rajasthan, I stayed at the Kasam Desert Safari Camp in Kanoi, near Sam Sand Dunes. 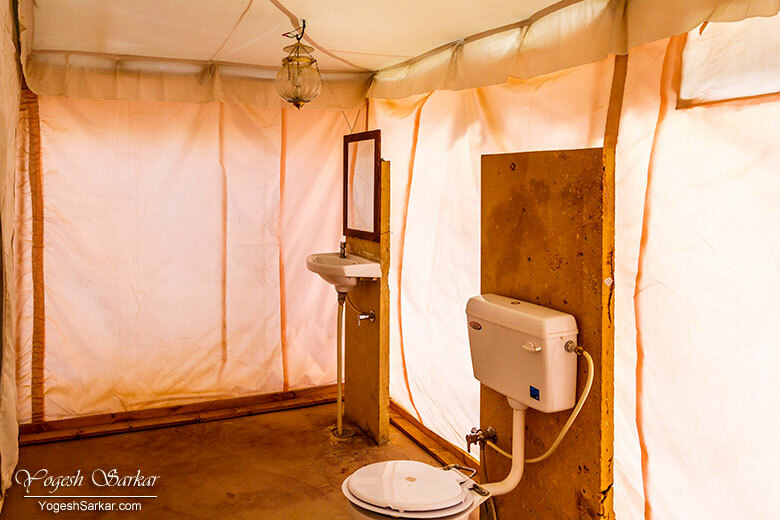 Initially, after reaching Kanoi, I had checked out RTDC Sam Dhani Resort, which has rooms as well as camps. However, for Rs. 4,000 a night (which included dinner and breakfast, desert safari in evening and cultural event) it didn’t really seem worth it since the cultural event was supposed to take place at another camp and we would have to commute to that place. 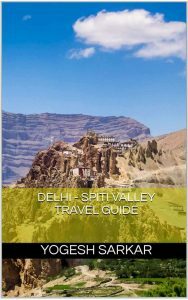 So our next stop was Kasam Desert Safari Camp, which was nearby and is run by Kasam Khan, who happens to be my friend on FB. Initially, we had a little bit of difficulty finding it since the camps are run in partnership and have the board of Royal Pavillion at front. So even though we were standing right infront of it, we couldn’t find it. A quick call to Kasam bhai resolved that issue and we went in and checked in. The tent was spacious and comfortable with a couple of charging points. 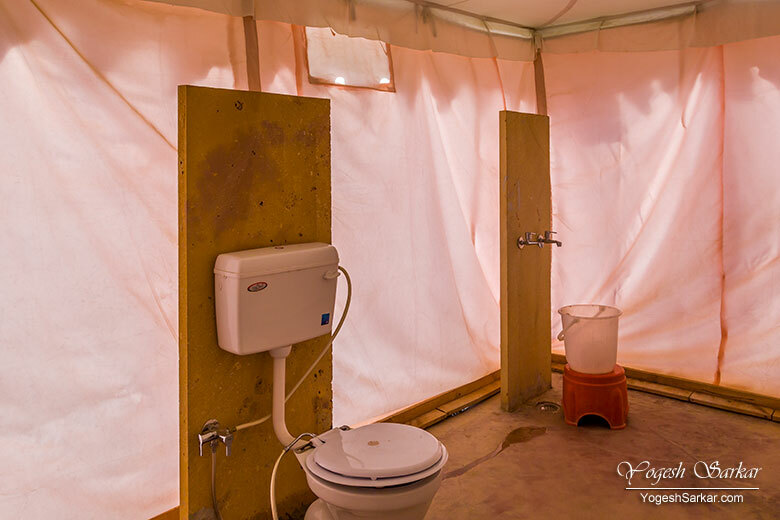 Though the washroom could have been a little better. After a cup of tea, we went with Kasam bhai for a desert safari in his Jeep. 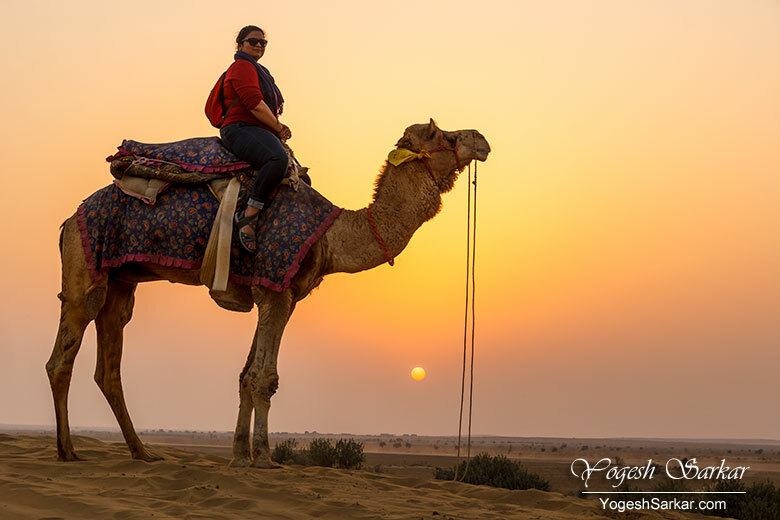 It was quite a rollercoaster ride and after reaching the sunset point, Mansi took a camel ride as well, while I shot the sunset. After I was done with the photography, Kasam bhai took Mansi for a short spin on the dunes, while I shot a video and a few photographs. 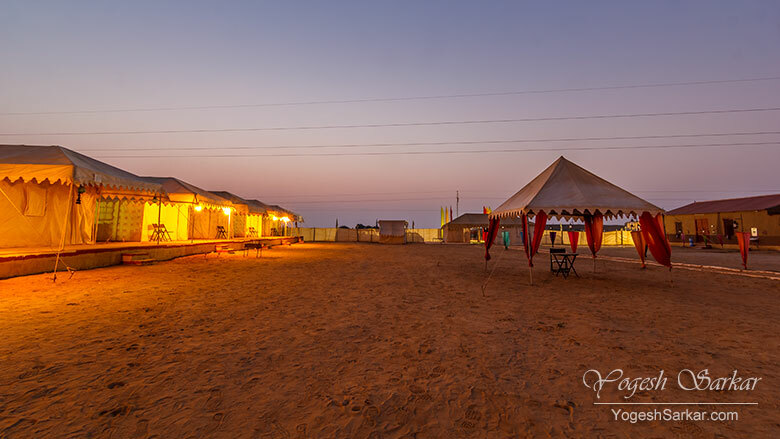 We came back to the camp as the night fell, where the Rajasthani Cultural Event was organized. The Cultural Event consisted of Fire Dance, Bhavai Dance, Morsing along with other forms of Rajasthani Folk Dances and Songs. Chai and pakodas were served during the cultural event, while hookah, alcoholic and aerated beverages were chargeable. The only sad part of the otherwise good cultural event was the fact that a family from Gujarat butted in time and again in performances, as can be seen in this video. This was just the tip of the iceberg. They along with another family from Karnataka even went to the extent of playing their own playlist of songs at the event. The local dancers couldn’t really dance to those tunes and frankly speaking, if I wanted to hear a bunch of Punjabi songs and watch a few people trying to pass on shaking of legs as dance (which these people were doing), I would go and watch the dance floor of Punjabi weddings and likely come back more satisfied! It was sad to see that for the supposed fun of a handful of people, mood of others was ruined. Because the large group from West Bengal left one by one, while we only stuck around because our hookah was still wasn’t over. And I was cursing myself for not bringing my headphones with me, that way I could have at least escaped this ridiculousness a bit. Frankly speaking, the organizers should ensure that only Rajasthani Folk Songs are played at cultural events, after all, that is what we were there to watch and enjoy! 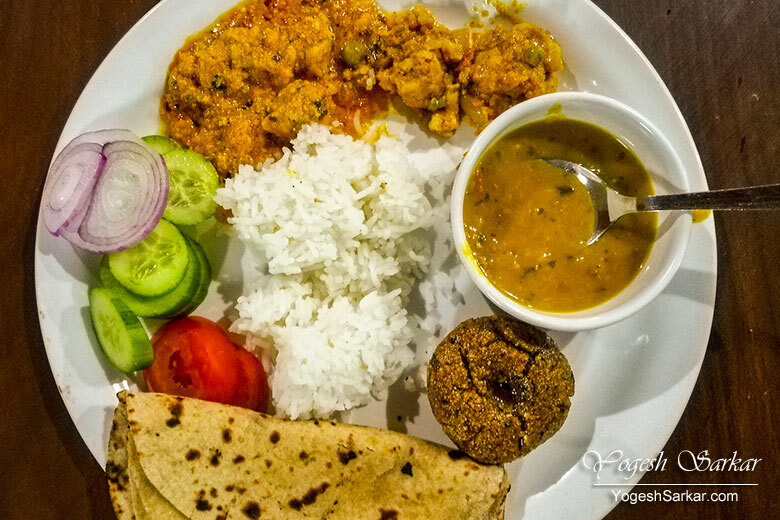 After the cultural event, we went for dinner in the dining room and it was a buffet consisting of delicious and finger licking Rajasthani food. After dinner I choose to sit in front of my tent, watching the stars. And apart from someone shouting at another camp in distance, it was really peaceful and beautiful. 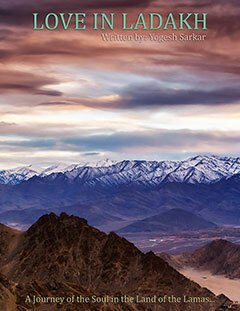 In the morning, there was another desert safari organized to watch the sunrise. 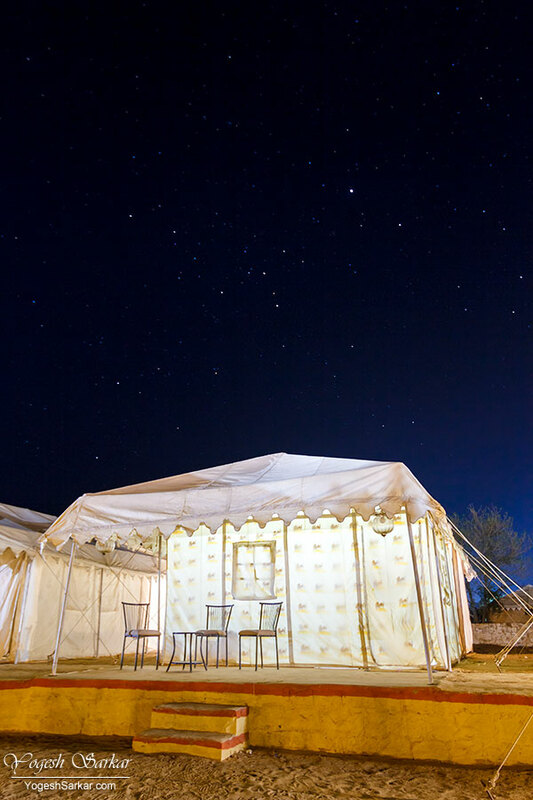 While Mansi opted for Camel Safari this time around, I decided to skip it and chose to shoot time-lapse at the camp. Breakfast was decent as well and overall, we had a nice stay at Kasam Desert Safari Camp. We had to pay Rs. 3,400 for it (plus Rs. 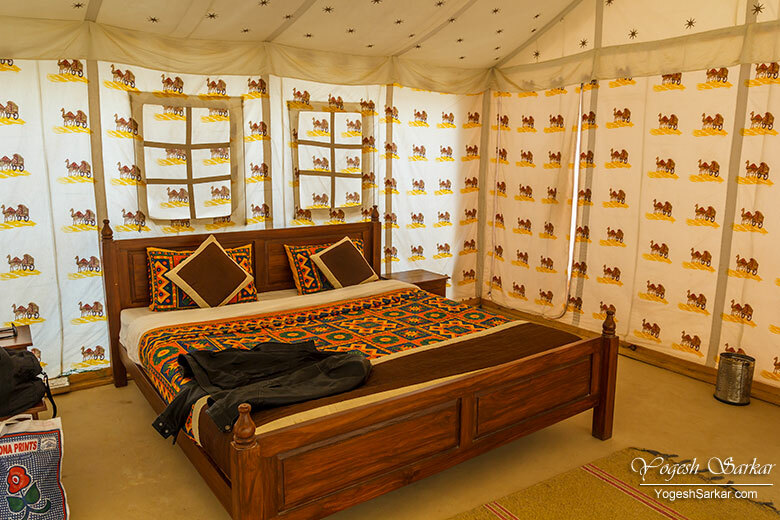 700 for hookah), which included stay, dinner and breakfast, evening and morning safari and cultural event in the evening.